Ticks are small arachnids that require blood meals to complete their complex little life cycles. Ticks are scientifically classified in the same family as spiders. The fossil record suggests ticks have been around at least 90 million years. There are over 800 species of ticks throughout the world, but only two families of ticks, Ixodidae (hard ticks) and Argasidae (soft ticks), are known to transmit diseases or illness to humans. Hard ticks have a scutum, or hard plate, on their back while soft ticks do not. Ticks have a life cycle that includes eggs, larvae, nymphs, and adult male and female ticks. The larvae, nymphs, and adults all need blood meals. 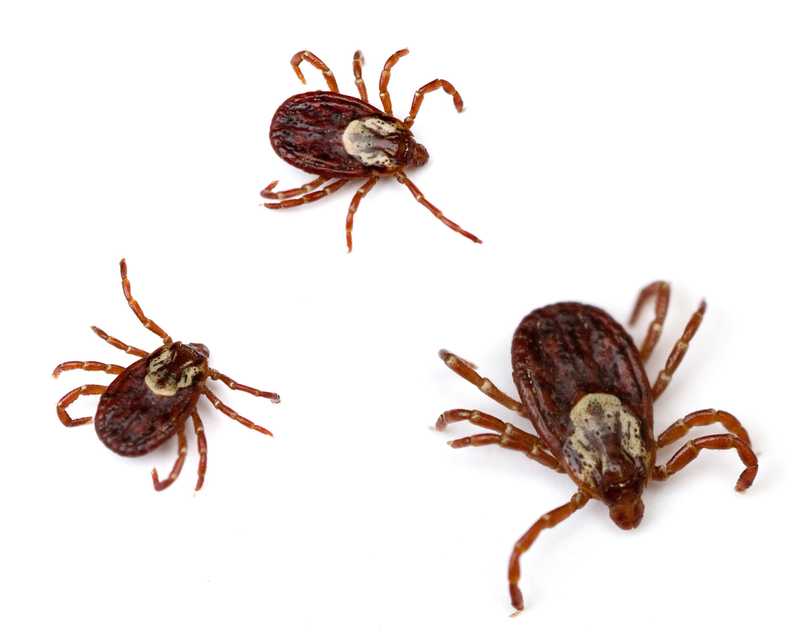 Usually, the female adult (hard tick) is the one causing the most bites as males usually die after mating. Ticks do not jump or fly. They simply reach out with their legs and grab or crawl onto a host. Although some larvae have preferred hosts, most ticks in the nymph or adult phase will attach a get a blood meal from several different kinds of animals, including humans. Except for a few species of larval ticks, the immature phases (larvae, nymphs) usually are even less selective about where they get a blood meal and are known to bite snakes, amphibians, birds, and mammals. Larvae are very small (about 1/32 of an inch with six legs), while nymphs are about 1/16-1/8 inch with eight legs and adults about 3/16-1/4 inch with eight legs. The complex life cycles are described in the last web citation below, and all of the web citations include pictures of various species of ticks. Although ticks will die eventually if they do not get a blood meal, many species can survive a year or more without a blood meal. The hard ticks tend to attach and feed for hours to days. Disease transmission usually occurs near the end of a meal, as the tick becomes full of blood. It may take hours before a hard tick transmits pathogens. Soft ticks usually feed for less than one hour. Disease transmission can occur in less than a minute with soft ticks. The bite of some of these soft ticks produces intensely painful reactions. Ticks are transmitters (vectors) of diseases for humans and animals. Ticks can transmit disease to many hosts; some cause economic harm such as Texas fever (bovine babesiosis) in cattle that can kill up to 90% of yearling cows. Ticks act as vectors when microbes in their saliva and mouth secretions get into the host’s skin and blood. Ticks were understood to be vectors of disease in the mid-1800s, and as investigative methods improved (microscopes, culture techniques, tissue staining), more information showed the wide variety of diseases that could be transmitted by ticks.